LTHForum.com - Soft shell crabs - who's making them? Soft shell crabs - who's making them? 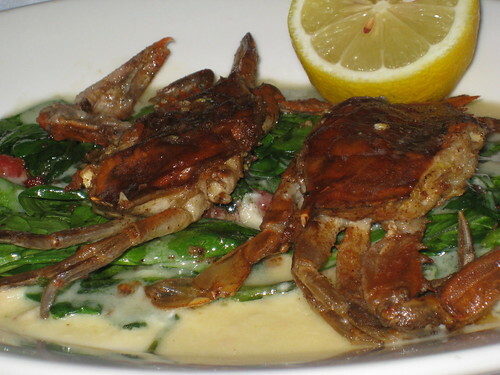 LTH Home > Chat > Eating Out in Chicagoland > Soft shell crabs - who's making them? qofu2 wrote: Never had them...love seafood but have never been able to work my mind around them. Remind me of spiders for some reason. They basically are spiders with claws... Just like lobsters are cockroaches or scorpions but they are some delicious bugs! Goose Island Clybourn had the soft shell crab BLT on the specials menu again as of yesterday at lunch. Sweets & Savories - served with a tomato and watermelon salsa. ETA - Also The Lobby in the Peninsula. Can't remember the prep though. Just had the soft-shell crab with avocado at Katsu on Friday night. Served in 4 pcs and listed as an appetizer. Really really good and highly recommended. My wife had soft shell crabs (3) dinner last night in Highwood at Washington Gardens. She loved them as she does every May and June there!!! They also have an appetizer with 1 soft shell crab. The Mrs. and I were at Bob Chinn's last week and they had them on the menu. I didn't go with it, but someone at a table nearby seemed to be enjoying them. sicilianos wrote: The Mrs. and I were at Bob Chinn's last week and they had them on the menu. I didn't go with it, but someone at a table nearby seemed to be enjoying them. I had the Chinn's soft shells not 1 hour ago. I had the salt and pepper version. Is this prep normally done with jalapenos? For some reason, I thought it was just S & P. Anyway, they were good (scratched an itch) but not great. Had s soft shell crab dish at Publican this past Friday. Last week Jerry's Sandwiches was running a special on soft shell crabs. I wasn't able to get over there but if I see them again this week I intend to try harder. Just had them on Saturday at Prairie Grass. They were good but I thought it tasted a little greasy. Haven't had them anywhere else yet. gastro gnome wrote: I had the Chinn's soft shells not 1 hour ago. I had the salt and pepper version. Is this prep normally done with jalapenos? For some reason, I thought it was just S & P. Anyway, they were good (scratched an itch) but not great. Chinn's lists three preparations for soft shell crab on its menu: sauteed, tempura fried, and "pepper," offered as appetizers as well as entrees. When I saw "pepper," I assumed salt AND pepper and didn't inquire further from the waitress--not a wise move, I concede (maybe you did, gastro gnome?). So I too was surprised to see the jalapenos in some pretty good-sized pieces. I enjoyed the little beasties (the crab as well as the jalapenos), but think next time (if there is one) I would go with another prep. tarte tatin wrote: Chinn's lists three preparations for soft shell crab on its menu: sauteed, tempura fried, and "pepper," offered as appetizers as well as entrees. When I saw "pepper," I assumed salt AND pepper and didn't inquire further from the waitress--not a wise move, I concede (maybe you did, gastro gnome?). So I too was surprised to see the jalapenos in some pretty good-sized pieces. I enjoyed the little beasties (the crab as well as the jalapenos), but think next time (if there is one) I would go with another prep. I didn't think the jalapenos were all that strong, so I didn't mind them. I wonder how working them in alters the cooking method, possibly keeping some of the crab from crisping? Anyway, eating them this way really made me want a simpler salt and pepper version. I'm heading to DC this weekend so I look forward to a gnome vs. crab rematch. This time, it's personal. I've seen a lot of press given to the so-called "devil's basket" of soft shell crabs at hipster hangout Sunda. Has ayone tried these yet. Have heard from Jeff at Va Pensiero that they are working up a soft shell appetizer. I went to the Reel Club (LEYE) this week for the first time, and when we specifically asked about soft shelled crabs, they said the chef could prepare some for us (it was not listed on the menu or as a special). It was deep fried with a light batter and served with tempura sweet potatoes and some other things. It was good and not greasy, although maybe lacking a little zing. A big portion, though. Wife Number One had them at Davis Street Fishmarket about 10 days ago. They aren't on the menu but we asked. She enjoyed them very much. Price for an entree portion + veggy & starch was about $20. Of course, I didn't have them and I can't recall the preparation now that you ask, but we just ate at Salpicon and they had them as a special, available either as an app or an entree. I remember reading the description and being tempted but finally opting in a different direction. The online menu doesn't help. Maybe you can call and ask--I can only recall that it sounded pretty good. (I think it was a very simple prep: seared in olive oil and topped with a garlic sauce...) Good luck! Hugo's Frog Bar in Naperville had them as a special -- lightly breaded and pan roasted, priced at $29. HB on Halsted had a great inexpensive special this week, plus BYO to boot. Ron A. wrote: Hugo's Frog Bar in Naperville had them as a special -- lightly breaded and pan roasted, priced at $29. And they are damn tasty. I like the saucy spinach bed, too. ^ The soft shells look tasty. Were you able to eat them, the crab cake and the WR bone-in ribeye in one sitting? Ron A. wrote: ^ The soft shells look tasty. Were you able to eat them, the crab cake and the WR bone-in ribeye in one sitting? Well, the crabcake was gone in a blink, and I could have finished the steak no-sweat if we hadn't already eaten oysters, shrimp Dejonghe (not a hit, in my book), Bookbinder's soup and two big baskets of bread...and seafood-stuffed cod, which was also very good. Plus we had to save some room for huge desserts (the berries in pastry were decent, if a little heavy on whipped cream/low on berries, but the Key Lime pie was among the best I've had in Chicagoland, and that's saying something, as it's my favorite type of pie). David Hammond wrote: Well, the crabcake was gone in a blink, and I could have finished the steak no-sweat if we hadn't already eaten oysters, shrimp Dejonghe (not a hit, in my book), Bookbinder's soup and two big baskets of bread...and seafood-stuffed cod, which was also very good. Plus we had to save some room for huge desserts (the berries in pastry were decent, if a little heavy on whipped cream/low on berries, but the Key Lime pie was among the best I've had in Chicagoland, and that's saying something, as it's my favorite type of pie). Sounds like quite an outing. Glad to hear you had a good experience there. We don't get out as much as we once did, but still frequent Hugo's (often with our one year-old son in tow). Hugo's and Gibson's seem to get mixed reviews on LTH, but we almost always have a great experience at the Naperville Hugo's. Interesting read on prepping soft shell crabs... Don't think I'd be brave enough to cut off their faces while they were alive! I have some friends who would really like to go out for softshells, but unfortunately, we always have to plan pretty far in advance. Does anyone know of some places that are serving softshells now that I could call and get an idea of how much longer the season will be? Also any tips for the best places to eat them would be greatly appreciated. I used to work for a guy who made a fantastic asian citrus vinaigrette that he served over softshells, but now he works for a big corporate place and its been many many years since I worked for him, so I don't want to ask him for any favors. I think they were probably the best softshells I ever had.